Jules: I know authors may get weary of being asked about inspiration, but can you talk about the genesis of Miss Brooks? It’s a really great book. Did you have a say in Michael Emberley as the choice of illustrator? Jules: What was it like to see Michael’s art for this title –- for the first time? Barbara: I was deliriously happy. It was so comical, apt, freewheeling, and so beautifully drawn. Jules: What influences your decision to illustrate your own titles? In other words, why do you sometimes have other artists illustrate your work? Barbara: My training was actually in Fine Arts — painting, to be exact. I never thought of writing; in fact, when I went to college, I took no courses in literature! When I was looking for jobs as an illustrator, the editors I met encouraged me to try my hand at writing. Looking back, I think it was probably because I was a good, but not great, illustrator and they probably thought if I wrote my own manuscripts, my chances of getting work would be improved. So, I did, and they were right. But as I began teaching at the New School of Social Research (Parson’s School of Design) in NYC, where eventually I was awarded a “Distinguished Teaching Award,” I began to be fascinated with crafting stories. That led me to write in almost every venue: feature scripts, television, journalism, song lyrics (recorded by Jim Henson and others), animation, and short stories. Now, my drawing savvy is probably latent, and there are so many gifted and amazing illustrators working today. I am thrilled to discover them. I brought Peggy Rathmann into the field, as well as countless others. There is only one more project, an early reader that I wrote with my husband, that I might draw, because it’s do-able and quite funny. Jules: You’ve written many books and have worked in children’s lit for decades. Two-part question here: What was your road to publication? And what are both some of the high and low points you see in the field of publishing books for children today (especially as compared to decades ago)? Barbara: I was a kindergarten teacher in Harlem during the Viet Nam War. (Yes, I’m that old). Since I had no Early Childhood courses at college, I was completely unprepared for my job. The only thing I thought I might be able to do was to teach the children to read by sounding out letters. They loved it! That experience led me eventually to draw storyboards for shorts at The Electric Company and Sesame Street, and I produced several films for them which won international awards. The obvious next step was to write and illustrate books. The field then had no real glamour, i.e. if you were in a chic party in New York or L.A. and said you wrote or illustrated books for children, people would wander away to find someone cooler to talk to. Now, of course, you can hardly be a bona fide celebrity, unless you’ve done a book for children. On the positive side, in the early days editors took an interest in new talent even before they were ready for publication. They took pride in developing newcomers; they had time to sit and chat! So many editors encouraged me way before I had my first publishable book. They saw my portfolio develop over time, shared titles they loved with me, and simply opened the doors of publishing. Now there is so much talent in the field, because it does have more of a cache, but most editors don’t have much time even for their ‘A’ listers. Jules: How do school visits inform your writing, if at all? Barbara: I love children for their frankness. When I visit schools, there is always some young child who will give me their unadulterated opinion on my books or tell me who they really love. They are more interesting to me than my die-hard fans. I love that children are bold and outspoken, so when I’m with them it strengthens my voice—it is a reminder of how fierce kids can be. They live in childhood; writers only visit. Jules: Can you tell me a bit about your writing process/”craft”? Do you outline plot before you write or just let your muse lead you on and see where you end up? Barbara: Let’s call it processes. It really depends on the project. Some ideas float in almost fully formed. Which isn’t to say there aren’t many rewrites after the initial inspiration. When it comes to writing a novel, of course, I work differently. I am a serial re-writer, even if I have an outline. I like to write in a free-form manner, hoping the characters will lead me into the plot complications. I’m strongest on characterization and dialogue, but I didn’t get enough of the plotting gene when it comes to my own novels, even though I have written and sold feature scripts and been on staff on a prime-time half-hour comedy, that rely on plot. When I have a writing partner—sometimes that is my husband, Gerald Kruglik—I do better, and, strangely, as a writing teacher, I do well on plot as well. What that is about, I have no idea! I worry that over-plotting can lead to contrivance, so it is always a dance between respecting what the characters dictate and keeping in mind the direction the author wants to go. I do respect that a story, if you are paying attention and you persevere, will eventually demonstrate its true form. 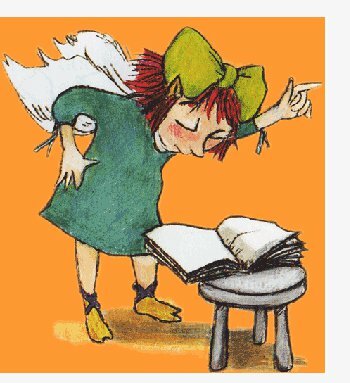 Jules: As a book lover, it interests me: What books and/or authors had an especially significant impact upon you as an early reader? 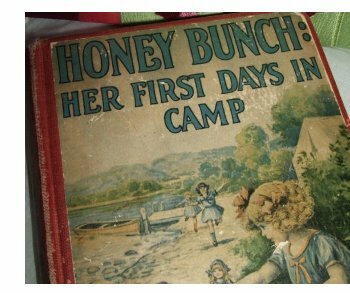 Barbara: Growing up, my earliest memory is reading Dr. Seuss and then the Honey Bunch books by Josephine Lawrence. The children had adventures and were on their own, and that was very appealing to me. Catcher in the Rye astonished me and everyone I knew. And Mark Twain, always one of my favorites. 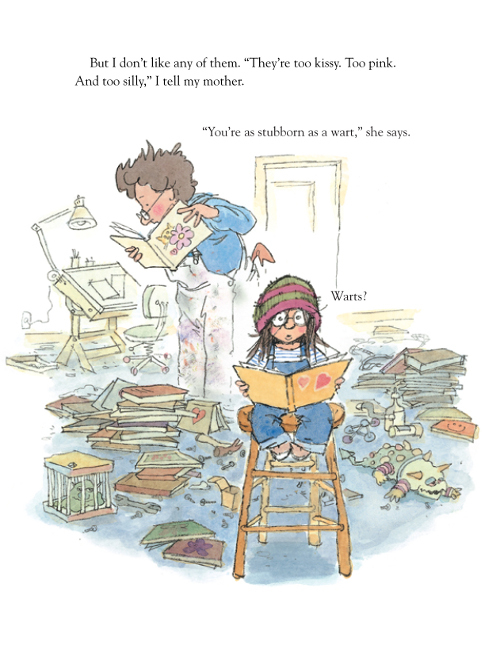 Jules: Okay, so this sounds cliché, too, but I still think it’s a good question: What advice would you give to aspiring picture book authors? Barbara: For one thing, I think it helps to have a good relationship with your own past. The people I’ve known who want to write for children but are running away from their own experiences have a tougher time. This doesn’t mean one must write in a strict autobiographical manner, but rather be able to use the memories, lessons, confusions, and even pains of the past as fodder for material. It can be disguised completely, but when one has that direct connection in the toolkit, the writing tends to be deeper, more authentic, and compelling. I also believe that it is possible to actually locate the age that is still alive within, that feels compelled to speak to children. I give assignments based on that idea. It also helps to be a fan of the form; there is often a phase writers go through where they want to copy whomever they admire. 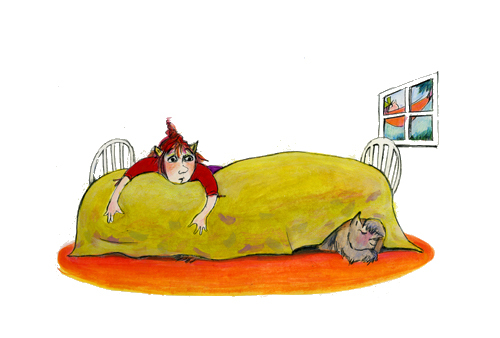 For years, I tried to be William Steig. I never succeeded, but my futile attempts taught me so much. Jules: How does teaching writing inform your writing, if at all? Barbara: There is no question that having to respond to stories for over three decades has made me a sharper writer. As I said earlier, I took no courses in literature in college: I was strictly an art girl then, so when I found myself teaching at Parson’s School of Design after publishing exactly one picture book (I was the evening continuing ed teacher while Maurice Sendak was for matriculated students during the day), I had to invent for myself all the elements of a story if I was going to help anyone. I do well with on-the-job training, so while I boldly ventured forth my opinions, I began to understand the writing craft along with my students. Issues such as voice, characterization, tension, reversals, obligatory scenes, pacing, point of view became clearer to me as I had to explain them to others. And it is a very enjoyable way to learn! Jules: Are you working on any new projects that you can tell me about? Any new YA titles in the works? Barbara: I co-wrote a screenplay that has garnered interest. Also there is interest on one of my books for feature-length animation. I’ve written a novel for adults that I’ve been off and on with for awhile and a middle grade novel as well that needs some serious overhauling. I always get picture book ideas, so there are several of them in process. I have a wonderful book coming out with Michael Emberley. And I just wrote one of the most provocative and funniest manuscripts of my career. And early 2011, I will be teaching a weekend course in writing for children at the Omega Institute in Rhinebeck, New York. Jules: What’s one thing that most people don’t know about you? Barbara: How about two? I stumbled into the theatre in my mid-twenties and worked with luminaries such as Sam Shepard and was directed by Joel (My Big Fat Greek Wedding) Zwick off-Broadway and internationally. Also, I have been long on the spiritual path: I am a seeker. That’s a lucky thing; I was fairly obnoxious for awhile. Jules: If you could have three (living) authors (or even illustrators)—whom you have not yet met—over for coffee or a glass of rich, red wine, whom would you choose? 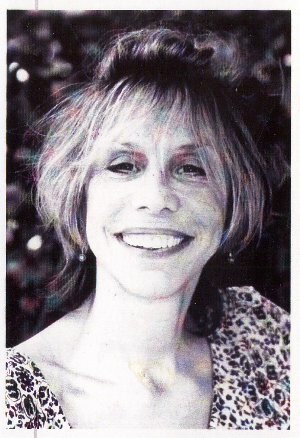 Barbara: Markus Zusak, Debra Eisenberg, Nora Ephron. Jules: Is there something you wish interviewers would ask you – but never do? Feel free to ask and respond here. Barbara: Don’t mind if I do! 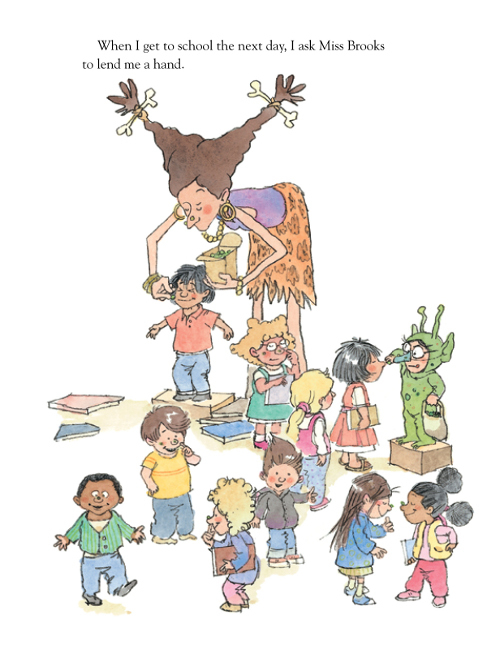 You have been a fortunate teacher through whose doors marched Lane Smith, Joe (Toy Story) Ranft, Peggy Rathmann, Barney Saltzberg, April Halprin Wayland, Bruce Degen, Robin Preiss Glasser, Alex Flinn, Denise Doyen, and Antoinette Portis, among many others. So, how did I develop a teaching philosophy that has benefited so many and why is it so uncelebrated? I’m so glad you asked! My childhood was no walk in the park, so I am drawn to work that respects that children have integrity, deep feelings, and need to be mirrored and validated. Humans love entertainment, but I don’t think a steady diet of pure entertainment is enriching, if it only offers surface pleasure. For me, when I first saw the drawings of George Grosz, whose work was about the atrocities of World War Two, I actually felt that there was a language that applied to me and it was incredibly important to me to make that connection. Also, for me, there is a sense that most people who enter this field have some kind of reason to revisit their childhoods. I don’t necessarily mean pain, but perhaps something unfinished or not clearly processed or understood. I like to encourage my students to discover the actual age of that sensibility. For many of them, there is more than one age, but for some there is mostly one location, one center to the part of them that wants to communicate with children. Our unconscious contains all our ages. I think successful work is written by adult children for young children, not only from the adult who is at the writing table. It is a beautiful thing when suddenly a strong voice emerges from a writer because they have, indeed, found the place that is still alive after twenty or thirty years. I ask a lot of my students often to dig deeper, reveal more, risk more, and mostly they thank me for it. It is not true that you can’t teach writing. You can’t teach talent, but you can teach craft and you can enhance talent through craft, diligence, and good feedback. I find it an honor as well as an amazing journey to witness a writer/illustrator improve and often out-perform what they imagined they were capable of. I began teaching in 1975. That’s thirty-five years discussing manuscripts and endeavoring to improve them. Many editors are aware of this mentoring role—since they publish my students and ex-students—but there is nothing set up inside this business to celebrate what I’ve accomplished. 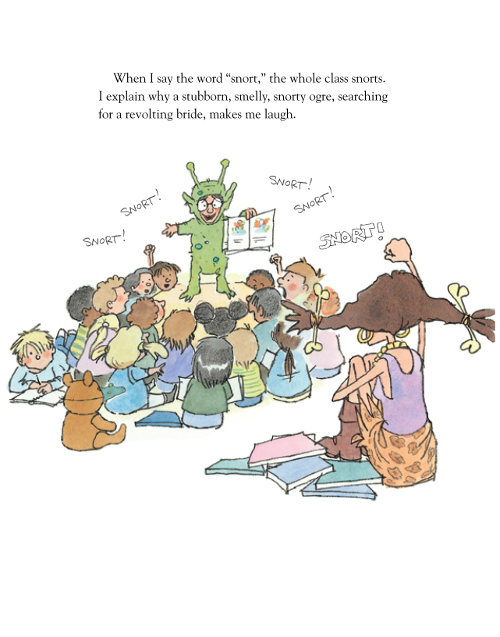 I have also been the teacher of some of the best children’s book teachers working today, but since I’m not affiliated with any university, it remains under the radar. But I’ve thoroughly enjoyed this part of my career and the talented writers I am grateful to have encountered. Barbara: Wit, depth, honesty, authenticity, perseverance, beauty. Barbara: Birds singing (if I’m awake). Barbara: I would have liked to be a dancer—was one when I was younger. 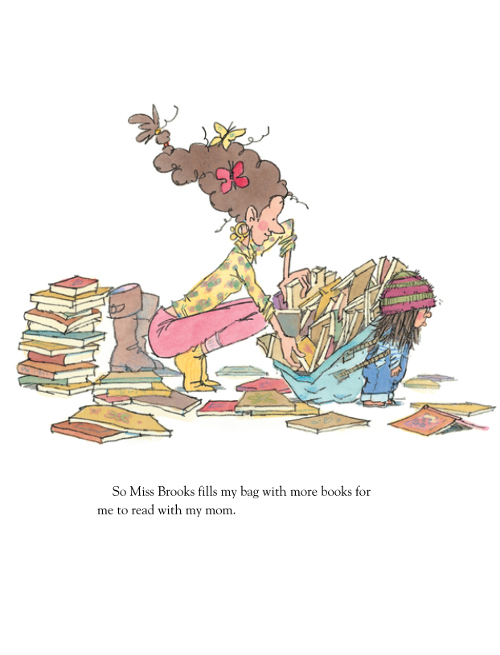 MISS BROOKS LOVES BOOKS! (AND I DON’T) Text copyright © 2010 by Barbara Bottner. 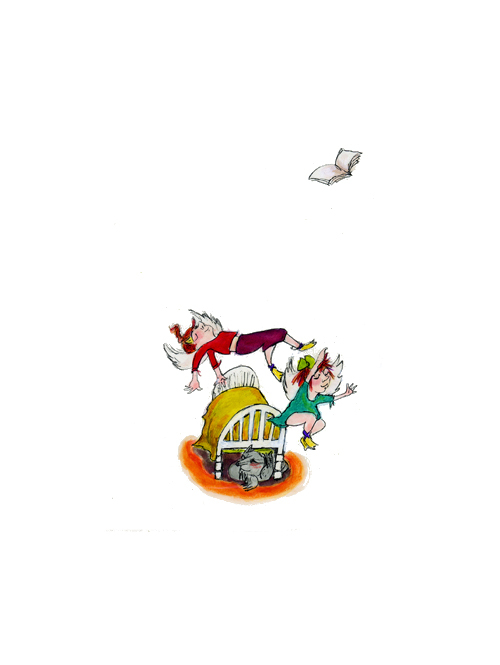 Illustrations copyright © 2010 by Michael Emberley. Reproduced by permission of the publisher, Alfred A. Knopf, New York, NY. All other illustrations, as well as author photo, used with permission of Barbara Bottner. I have been a BB fan for.. .forever. Yet have never really met her, which is odd since we are clearly sisters. Thanks for this wonderful WONDERFUL interview, Jules. So many Jules’ jewels. I love BB’s “There is no question that having to respond to stories for over three decades has made me a sharper writer” and “Humans love entertainment, but I don’t think a steady diet of pure entertainment is enriching, if it only offers surface pleasure” and “I like to write in a free-form manner, hoping the characters will lead me into the plot complications” and especially “I worry that over-plotting can lead to contrivance” which I must stick on my wall. This is one of those books that I checked out of the library a bit too many times and finally put it on my must-buy list. Love the humor and the way Missy is drawn. What a great interview. Thank you, Jules and Barbara. Especially the unasked question…thank you for asking and answering it. I, of course, then wondered about all the unasked questions that might be asked and answered and asked and answered. Ms. Bottner is my neighbor. We became fast friends. She is as fabulous as she sounds! She is also a very snappy dresser. This was such a helpful interview and I will be applying its many wonderful insights to my own humble efforts. a wonderful interview with a dear person i’ve had the pleasure of knowing since we were teenagers growing up in a community which placed so much pressure on being perhaps something different than what our impulses were telling us- and she’s been successful at it! and the “unasked question” is a great poser! Thank you Barbara for generously giving wisdom and stimulating great laughter. This is an amazing interview! It gives us such a full sense of Barbara Bottner, who she is and why her books and her teaching have touched so many people. She is electric, you can feel it in everything she says. She may be an unsung hero, but I’m sure there are many of us who quietly and privately celebrate her. Wow! Totally fab interview. Thanks Jules and Barbara! Thank you for this wonderful interview. Reading it was like taking a vitamin for my own writing. I also look forward to sharing her insights with my writing students. Barbara is the first I’ve heard who has been able to articulate the significance of having “a good relationship with your past.” How very true that is. She is such a hero! 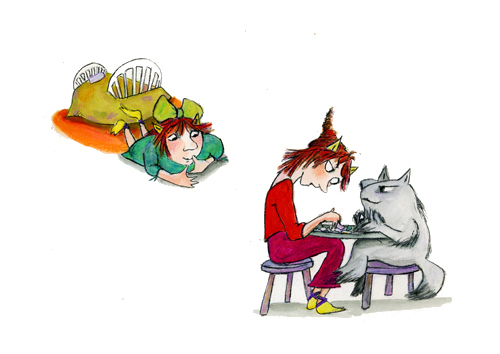 Jules — Thanks for featuring BB on 7 Imp. You asked just the right questions to bring out her spirit: generous with her wisdom, passionate about kidlit and still a (lovable) contrarian. Thank you Jules, for giving me the opportunity to communicate what is so close to my heart and has been for so many years! I am also touched by the comments left here….very much so and by giants like Jane Yolen and Frances Foster, both of whom are heroes to me. Wonderful interview! This is a great book by a great writer — she speaks to the individuality in a person and is a true indivual herself! COOL. Glad you did this interview with BB, alias Bootsie Barker… You know Bootsie does all of Barbara Bottner’s press these days, chained to her desk, while BB sits in a lounge chair by the pool sipping organic daiquiris. It’s true. Notice the initials are the same???? Free Bootsie! Invite her to the ball! Per courtney’s comment (and Michael’s). NOTE: Ms. Bottner taught for many years in New York. Later in Florida. Now, we have her in Los Angeles (and we’re keeping her and Bootsie chained to their desks and/or lounge chairs so they won’t wander off.) Ha! Loved this interview, packed with such richness and goodness. Thanks!